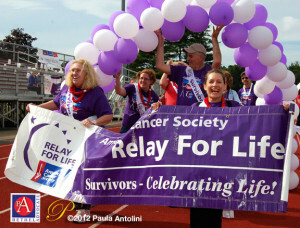 Photo: Bethel Advocate file photo of Relay For Life event in Bethel, CT.
We hope you will attend this great event on Saturday, June 10th from 11 a.m. to 11 p.m. on the Bethel High School Track, 300 Whittlesey Drive, Bethel, CT! View Full Schedule of Events below. The Relay For Life (RFL) of Bethel has been a staple of our community for the last 23 years. When they first began, the event included most of Fairfield County. Over the years, each community has taken the opportunity to create their own event. However, RFL now are so grateful to see the communities of Danbury, Brookfield, Redding and parts of Ridgefield and New Milford join us again. 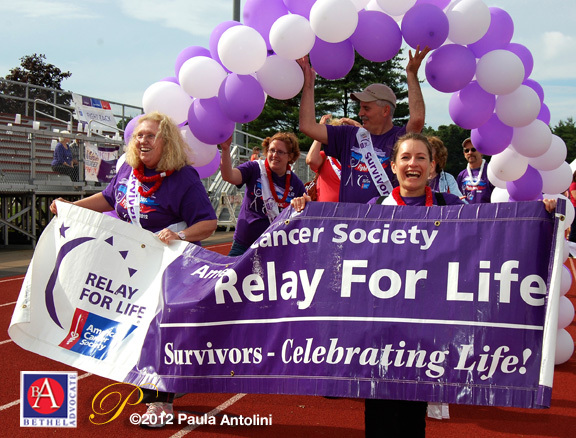 Because of this, RFL is changing the name to the Relay For Life of Greater Danbury! All surrounding communities are welcome to join this event that means so much to so many people. Come for an hour, or stay the whole time, and celebrate hope with your community! ***If you would like to purchase a Luminaria Bag in honor or in memory of someone, you can do so at the event. ***If you are interested in donating your hair to Pantene Beautiful Lengths, A New Beginning Salon of Bethel (an Aveda Salon) will be cutting hair from 1 to 6 pm! Attend these events to bring communities together to remember loved ones lost, honor survivors of all cancers, and raise money to help the American Cancer Society make a global impact on cancer.